Unfair Sonic is a Sonic troll game originally created by Gamejolt.com user Master Games. It is a funny troll prank game that resembles the classic 2D Sonic The Hedgehog games, but it’s full of traps. This game is totally unfair lol. You will die a lot. It is sure to make you rage quit. This game has become popular on Youtube. A lot of funny rage’s watch. The best strategy to this game is to remember where and how you died so you don’t make the same mistakes again. Below you will find Official and Unofficial Unfair Sonic games that can be played online or Downloaded. Enjoy! 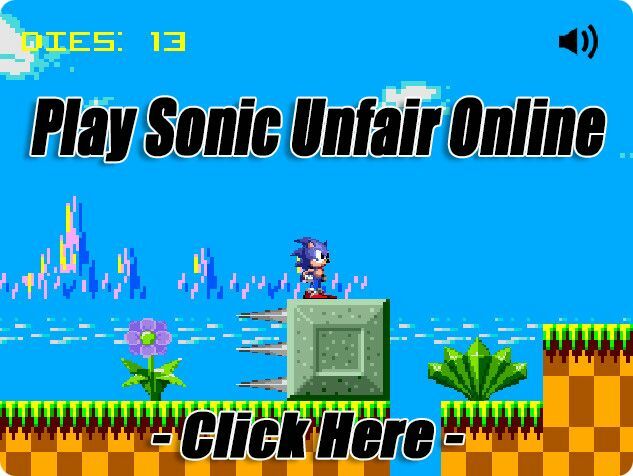 Click the Above link, then click the play button, to play the original HTML5 version of the Official Sonic Unfair Game online. Hosted by Gamejolt.com and created by Master Games. Make sure you are using a PC, Mac or Chromebook when playing these games online. Game Instructions: Run and jump. Try to avoid traps and be sure to move fast. See if you can beat this hard game. Controls: Use “Arrow Keys” to run and jump. “R” Key to restart game. Download Game Here: Download The Beta Desktop Version that runs on windows PC. The above game was created by Scratch.EDU user T-Rex9000. Click the above green flag in the grey play box to start the game. This Unofficial Unfair Sonic game is a simple recreation of the original. It Uses the same controls as the original game labeled above. This Sonic Unfair fan game was created by sonicresearch.org user Joshwoakes. It’s a completely new Recreation based on the classic Sonic The Hedgehog Game engine. This game is very difficult to play. Much more difficult than the original and scratch edition Unfair Sonic games. Almost everything you do will make you end in death. A lot of trail and error. Fun game once you get the hang of it though. Just stick with it and if it’s too much trouble watch the walkthrough below. Game Instructions: Run and avoid most anything that looks strange. You will die a lot but just remember your mistakes. Hope you enjoyed this page. When new Unfair Sonic games come out we will post them here, So check back every once in a while. If you enjoy these hard troll games lol.